The floods in Bosnia and Herzegovina, Serbia and, to a lesser degree, in Croatia brought destruction and death to large areas. Thousands of homes were destroyed, some had been painstakingly rebuilt after the war, thousands of landmines swept away to new locations, livestock killed, mass graves from the war unearthed and roads ruined. Beyond the destruction, the floods also revealed the weakness and the strengths of the countries. It is a cliché to say that moments of crisis and disaster brings out the best and the worst in people. In Bosnia and Serbia, it mostly brought out the best in people, and the worst in states. Natural disasters test states whether they are weak or strong and their response (or lack thereof) often shatters citizens trust. When the earthquake in Haiti struck in 2010 killing a quarter of million people, it destroyed the state itself, which been weakened by decades of crisis. In New Orleans hurricane Katerina brought misery and scenes nobody would imagine could occur in the United States. The response appeared to be of a state that did not care about its poor and ready to tolerate great misery among its citizens. The floods in Bosnia and Serbia showed that two very different states were utterly unprepared for the disaster. Both states and their local (entity, etc.) authorities responded late, with limited means and inaptly. What is important here is the similarity between the two countries. Serbia is often considered more functional than Bosnia, with a centralized state, clear lines of authority and without complicated and competing authorities as in Bosnia. Yet, both did badly. This suggests that despite all justified critique of Bosnia’s complicated institutions, the cause of the incompetence lies elsewhere. Some of it lies with political leaders who did not take the problem seriously and in politicized, hierarchical systems: if the leader does not take it seriously,neither does the state. In fact, the state and political elites sometimes blamed citizens rather than shouldering responsibility. In Serbia, the response to the floods also shed light on the authoritarian and populist tendencies of the current government. The disaster-management populist hubris, was reflected by multiple live transmissions of government sessions in its function as emergency committee (15 May, 23 May). The sessions had little calming effect, but rather gave the message “the situation is horrible, but we will take care of it”. It fit the image of the new prime minister as the serious, always concerned leader, taking the suffering of his citizens serious indeed. The personification of the disaster response fits the emerging character of the current government, dominated by the over-towering Vučić. The government spreads panic and then offers Vučić as the savior. Whether this strategy will succeed will depend on the ability of the government to either deal effectively with the aftermath of the floods or its ability to effectively deflect criticism. The authoritarian side of the government became visible through the censorship the government appears to have engaged in. Websites and blogs critical of the government and Vučić were taken down (see here, here). 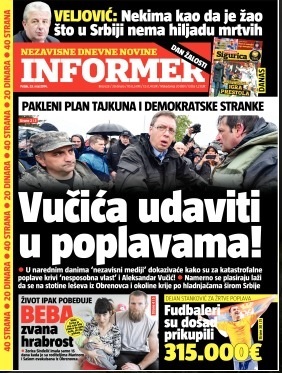 In addition, a tabloid close to the government suggested that the floods were the pretext of a plot of businessmen and the opposition to take down Vučić. The floods have also provide for a template on which to project different ideological visions and hopes. Srećko Horvat, for example, argues that it is the neo-liberal transformation that hollowed out the state to be unresponsive and inept. Such an observation is obviously implausible as the lack of investment into public infrastructure in Serbia and Bosnia over the past twenty years is not the result of neo-liberalism or the privatization of public utilities. Little has been privatized and certainly much less than elsewhere in Europe which copes better with natural calamities and the causes are very different. 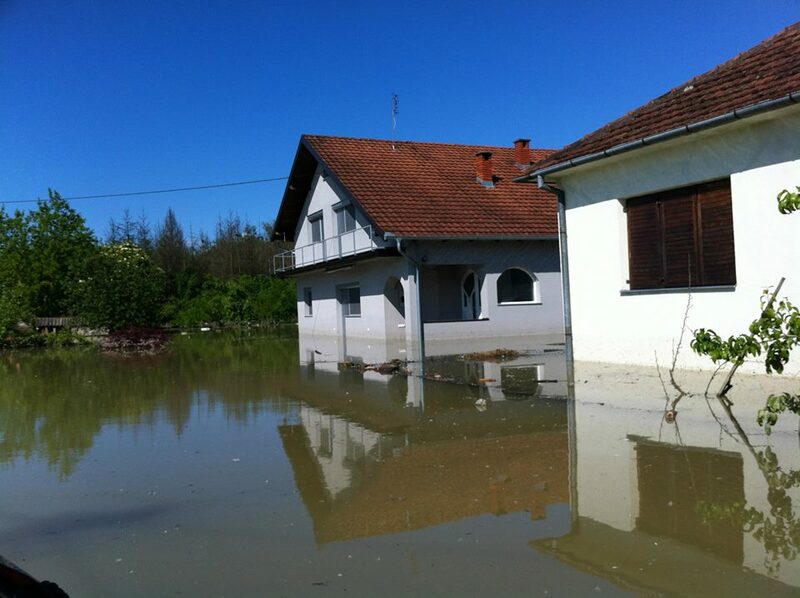 The state and the local authorities in Bosnia and Serbia have been ill-prepared to deal with the floods. Thus, the failure lies with the state, not private utility companies. Now, I would not argue that this necessarily means that the state should privatize public utilities and infrastructure, but the critique of neo-liberalism misses the point. The lack of investment and maintenance of the public infrastructure that became visible through the floods has several causes: a) neglect and destruction during the 1990s that takes a long time to address the consequences; b) party appointments and favoritism has undermined the public administration and reduced professionalism; c) hierarchical power-structures contribute to slow responses in times of crisis. Altogether, this would rather suggest that the problems are not with the private sector, but with the state. This does not mean that privatization would be the solution. As the far-reaching privatization of public utilities in some countries, such as the UK, demonstrated, this in itself it can also lead to underinvestment and convoluted lines of responsibility. The central question thus how to make the state more responsive. Besides the obvious need to reduce party appointments and focus on the re-professionalization of the public administration, it would also be good to think about ways in which state-owned companies and utilities can be better sheltered from political pressure and influence to be able to act independently. The other theme that flood revealed is that of solidarity. The failure of the states to take of their citizens brought about a great degree of solidarity between citizens. In Bosnia the plena that had emerged as a result of the February protests organized assistance where the state failed and there are many reports of citizens helping others across lines of division, be they entity or state boundaries or ethnic borders. However, it might be once more overinterpreting the solidarity as a renewed “Yugoslav community” as for example Andrej Nikolaidis does. Support and assistance comes from others well beyond the Yugoslav space, thus reducing solidarity to the people of Yugoslavia is being unfair to those assisting beyond. The key question will be how to transform the solidarity of the floods into a more lasting form of rapprochement. Here, it merits to look south, to Greece and Turkey, who experienced a breakthrough in relations as a result of “earthquake diplomacy” following devastating earthquakes in both countries in 1999. James Ker-Lindsay noted at the time in an article that the earthquake in both countries did not bring about the rapprochement by itself, yet it helped by providing it with a momentum that brought both citizens and political elites closer together. The floods, for all their horror thus provide an opportunity, whether it will be seized and become transformative remains to be seen.